Shooter of medieval tone and flashy weapons galore, Lords of Thunder graced the Sega CD two years after its original release on the PC Engine CD/TurboGrafx-CD. Released both in Europe and in North America, the game has garnered a somewhat solid fanbase throughout the years and is frequently remembered as a flagship of the shooting genre when people talk about the Sega CD. It’s also one of the few Sega CD shmups that’s often remembered or cited by other retrogaming circles. Why is that, I wonder? My best guess is the heavy metal, guitar-driven soundtrack, an aspect that not only celebrated the CD format but also stood as unique in the gaming scene at the time (perhaps the only other title that also dared to bring its music closer to contemporary rock sensibilities was Android Assault, also on the Sega CD). Heck, even in further generations I can't name a single game whose music leaned so much towards the style, so many kudos to Hudson Soft for the generous offering. Several narrated intro and in-game sequences tell the story of a knight named Duran, who embarks on a mission to rid the kingdom of Mistral from evil dark generals – the lords of thunder, each one controlling this element of nature to morph into a devious creature that must the defeated at the end of every stage. Their order can be freely chosen by the player, but only after all six continents have been cleansed of evil is Duran able to enter the lair of the final enemy. Our brave knight Duran must choose one out of four different armors in every stage: fire, water, earth and wind. Each one has a specific bomb animation, and even though that might seem the case, the elemental tone of these armors/weapons is purely aesthetic, with no active effect during gameplay (water does not fight fire, for instance). That’s why a favorite armor is always determined by personal preference. Once the armor is selected the player stops by a shop where special items can be purchased with the crystals collected throughout the game, only then proceeding to experience heavy metal shooting action. 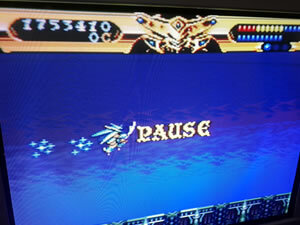 Two bars on the top of the screen measure the player’s current condition. The upper one determines firepower according to three levels, which must be filled by taking the colored items with thick borders: blue ones add one upgrade point, red ones add five upgrade points. The lower one represents health and is regularly replenished/filled by taking the heart item. Watch out for this one, it determines the end of the game if it gets depleted (attention: getting hit succesively also takes away precious power-up points). Item pick-ups are released in spades by defeated enemies, but most of them will be crystals/gems to be used as currency in the shop (blue ones have a value of 5, red ones are worth 10). Don’t take too long to collect them, they disappear after hovering in place for a little while. Endowed with solid sprite work and great enemy diversity, Lords of Thunder has perfect pacing for a 16-bit shooter and doesn’t demand too much with regards to challenge. Durand is allowed to touch walls and even walks when at surface level, slashing his sword automatically whenever an enemy is at close range. This sword slash is the most powerful attack in the game, and the main reason why the Sega CD port sounds so much easier than the original on the PC Engine CD. The only addition that tries to impose some extra difficulty on the Sega CD is the brief stun effect the character suffers when he gets hit, but the truth is that it doesn't do anything too serious in the long run. Regardless of the perceived difficulty, playing the game safe is always possible due to the shop gimmick. Provided you have enough crystals, you can always get out of it with full health and fully powered with a 3-hit shield, a resurrection potion and the maximum amount of three bombs. Bombs, shields and resurrection can only be found in the shop, and the best news about this is that the lady who sells the items doesn't know the concept of inflation (unlike the shopkeepers from Fantasy Zone or Forgotten Worlds, for instance). Being stingy and ignoring the shop, on the other hand, is an integral part of the game's scoring system, simply because at the end of the game (if you 1CC it, of course) the amount in the crystal counter is multiplied by ×10 and then added to the final score. This multiplier is one of the crucial changes in this port, one that diminishes the importance of crystal collecting by a large margin even if there's no max limit to this final bonus as in the PCE CD (where you have a ×100 multiplier but a final reward capped at 1 million points). Sure, crystals still provide a score boost on the Sega CD, but since it's not that great an addition the old "kill-everything-that-moves" ends up being the best scoring strategy in the grand scheme of things. 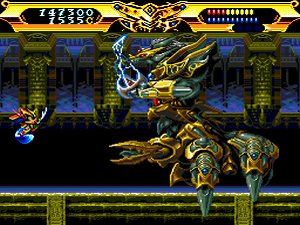 The Sega CD port of Lords of Thunder is often subject of heated fan disputes with the original on the PC Engine CD as to which is the best game. While the soundtrack certainly boils down to personal preference, the downgraded difficulty and the changes made to the scoring system on the Sega CD kinda tick me in a negative way, so in my opinion the original game stands as the superior version. Both are quite fun in their own right however, and should definitely be experienced by all 16-bit video game fans, shmuppers or not. In my best 1CC result shown below (Normal difficulty) I used exclusively the water armor and restricted my purchases in the shop to bombs only.